Despite the volume of work Shakespeare produced, surprisingly few of his plays directly concern money and the economic mindset. Shakespeare and the Economic Imperative examines the five plays that do address monetary issues (The Comedy of Errors, The Merry Wives of Windsor, The Merchant of Venice, Measure for Measure and Timon of Athens), plays in which Shakespeare’s view of how economic determinants shape interpersonal relationships progressively darkens. In short, what thematically starts out in farce ends in nihilistic tragedy. 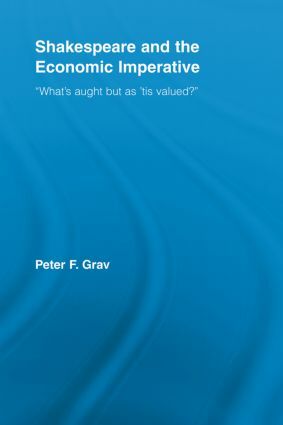 Working within the critical stream of new economic criticism, this book uses formal analysis to interrogate how words are used — how words and metaphoric patterns from the quantifiable dealings of commerce transform into signifiers of qualitative values and how the endemic employment of discursive tropes based on mercantile principles debases human relationships. This examination is complemented by historical socio-economic contextualization, as it seems evident that the societies depicted in these plays reflect the changing world in which Shakespeare lived and wrote.